When they brought this out to my table, my face clenched. Crap! Did I just make the same mistake again, ordering bulgogi stew instead of bulgogi on a grill?? The staff tried to explain it to me; I think she was trying to say that I was dining solo, and hence they put it in one of those pots rather than on a grill. Fair enough; it didn't seem like a stew in the end, but this is the first time that I've seen bulgogi served this way. Is this common? It was impressively tender and tasty either way, all without being excessively sweet. It reminded me a bit of sukiyaki, in fact. Anyway, this was from a 24 hour shop in Gangnam-gu (6 Dosan-daero 101-gil, 02-546-5739) that is apparently quite famous for post-drinking (yet expensive) food. Either way, I'm kinda interested in coming here for breakfast one day. A lot of the reviews that I read suggested that the bibimbap is the thing to get. 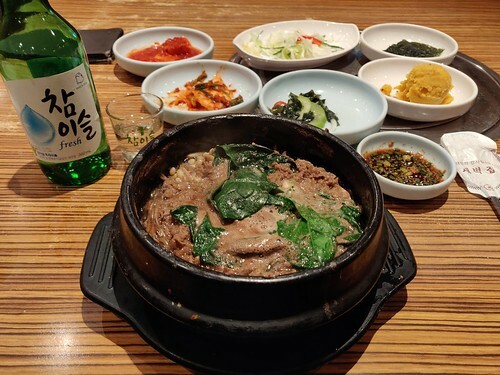 Epilogue: the local team just told me that this was called ddukbul, which is what you end up getting if you only order one portion of bulgogi. They seemed more amused by the bottle of soju in the photo, as it is considered odd to drink by yourself. Ironically, I was just thinking about how awesome those bottles are, as they are just the right amount to give you a bit of a buzz without being excessive, and all for the bargain price of just 6000 Won (US$5.25).